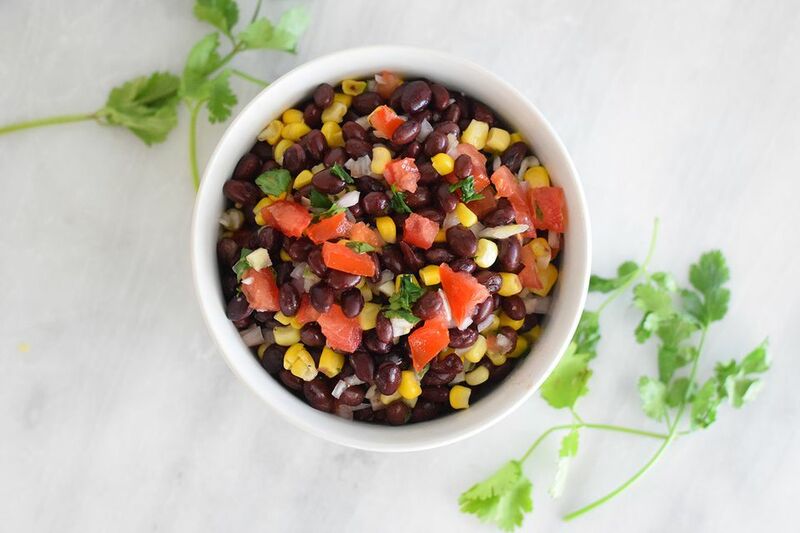 Simple and fresh, black bean salsa is incredibly easy to whip together at home when you're looking for an alternative to the traditional red tomato one. It's especially great in the summer months when corn, tomatoes, and cilantro are all in season together at once. This recipe is super versatile and ripe for customizing any way you want to. Try adding in some chopped avocado or give it a smoky kick with diced chipotle pepper or dash of adobo sauce. Sweeten things up with pineapple, peaches, or mangoes—you'd be surprised how the fruits pair with the salty and spicy ingredients. Plum tomatoes are recommended because they're sweet and firm, but you can easily substitute in beefsteak, heirloom, and other available tomato varieties. Just make sure to cut the tomatoes finely, so pieces aren't bigger than the black beans. This will make easier to scoop and ensure that you get a bite of all single ingredient in every mouthful. You can also make black beans from scratch if you prefer them to be a little firmer (most cooks agree that the canned ones have a mushier texture). To do so, simply soak a batch of dried beans overnight and then choose your favorite method of cooking. We love the effortless hands-off technique of dropping them in a slow cooker, but they're easy to toss in the oven and bake, too. To store: The black bean salsa will hold in the refrigerator for up to two weeks, so it's a great make-ahead appetizer if you have a party coming up. Drain the entire can of black beans and rinse them thoroughly. Toss the beans with the thawed corn kernels. Set them aside while you prepare the other ingredients. Chop the plum tomatoes, red onion, and jalapeno into a small dice, leaving in the jalapeno seeds and vein if you want a spicier salsa. Mince the clove of garlic. Chop up the cilantro and set aside. Toss the plum tomatoes, onion, jalapeno, and garlic together with the black beans and corn. Whisk together the lime juice, olive oil, cumin, and salt in a measuring cup. Pour the lime juice mixture over the black bean mixture and gently toss, being careful to not break up the beans. Top with the chopped cilantro. Allow the salsa to sit covered in the refrigerator for at least 20 minutes so the flavors can mingle and meld. Serve with tortilla chips or on top of tacos. Why Buy Canned When You Can Make Your Own Amazing Black Beans? How Do You Make Vegan Frijoles Negros (Black Beans) From Scratch?